Pastor’s wife, Bible teacher, encourager, redeemed perfectionist. All these describe Christian speaker and author Nancy Kay Grace. Nancy’s biblical teachings revolve around seeing God’s grace in everyday life, self-worth from God’s perspective, and pressing on during tough times. She communicates the Word of God in a deep and challenging way, mixed with humor and personal experience. Her heartfelt desire is to help others over come trials through God’s grace. Nancy is married to her best friend, Rick, and have served together in the pastorate for more than forty years. Currently, Rick is a senior pastor in Northwest Arkansas. Rick and Nancy have presented over 40 weekends as a clergy team couple for the international ministry of United Marriage Encounter. They have presented marriage enrichment in England, Malaysia, Taiwan, Ireland, and throughout the U.S. They also have worked alongside believers teaching discipleship in the Russian Far East and encouraging new churches in Kenya and Tanzania. She and Rick have taught Marriage and Family at Ecclesia Bible college. These experiences have given Nancy a strong foundation and understanding to relate to women in all stages of life and encourage their faith. If there’s a new book on prayer, I’ll buy it. 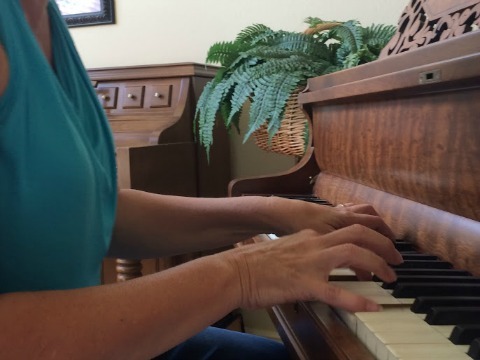 Playing worship songs on piano relaxes me. I also enjoy teaching piano, sharing my love of music with students of all ages. My husband and I sip coffee on the patio while watching the birds in our backyard. Together we try adventurous activities like zip-lining, white water rafting and kayaking. And then we have coffee. My maiden name was Szalaj. My paternal grandparents immigrated through Ellis Island from eastern Europe. Chicago is my hometown although I’ve also lived in small towns of a few hundred people. My precious grandchildren call me “Nama” which means “grace” in Swahili. Why Swahili? We learned we would become grandparents after our mission trip to Africa. I’m a cancer survivor. Six biopsies on my tongue (ouch!) have removed suspicious tissue; twice it was cancerous. I had to relearn how to talk. I am not seen on television as a legal journalist. I speak on the grace of God, not law. The reason I speak and write is to draw you closer to the Lord Jesus Christ. We all have sinned and have been separated from God; no one is immune. Sin has created a chasm between us and God.Yet because He loves us and desires relationship with us, He made a way to span the sin-chasm. He sent his Son Jesus Christ to pay the penalty for our sin, the sacrifice of his life on the cross. Through His resurrection Jesus became the bridge that connects us to God. When the heart is surrendered, you can begin a new relationship with the Creator of the world as the Lord begins a new work in you. This verse changed my life and gave me hope. Come to bold faith in Jesus Christ. Ask forgiveness for your sin. Accept the offer to become new in His love. Add this to your bio. It is the most important thing and makes an eternal difference.